On a flight to New York City, Elder Gerrit W. Gong of the Quorum of the Twelve Apostles of The Church of Jesus Christ of Latter-day Saints struck up a conversation with his seat neighbor. She spoke at length about Italian artists, a clear passion of hers. Elder Gong, relying on the basic knowledge of the humanities he learned at BYU, managed to maintain a conversation. After some time, the woman opened up about the tragic loss of her son. 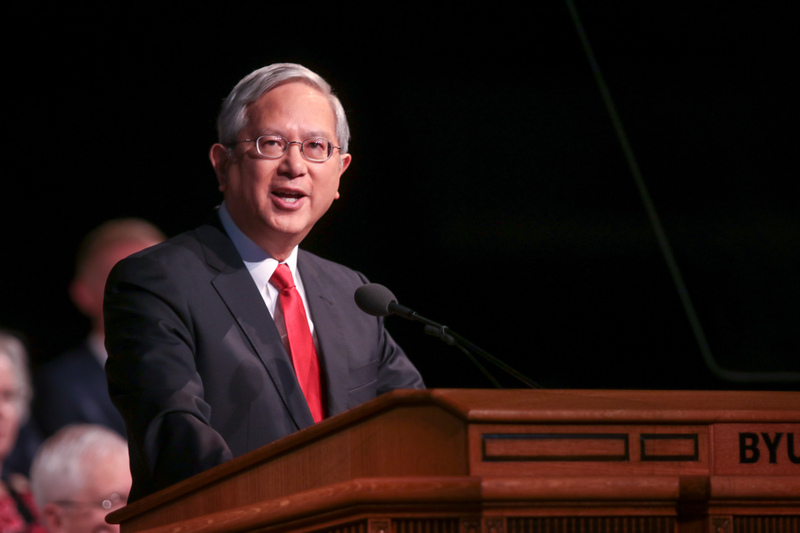 Thanks to his education, Elder Gong was in a position to share the gospel, a lesson he invited listeners to take to heart during an Oct. 16 devotional address in the Marriott Center. Elder Gong said he learned lessons at BYU that have been important in his life to varying degrees, like learning the difference between bleach and detergent when doing laundry and the difference between a collared shirt and a collared pajama top. He led students through a thought experiment where he illustrated what lessons students are learning now that they will think are the most important in 2040. Elder Gong also encouraged students to learn by the spirit by doing small and simple things like going to class, picking good friends and environments, and learning facts, skills and attitudes. Elder Gong emphasized the importance of good friends through a story where his BYU friends went on a road trip. His friends bought a box of Book of Mormons, wrote their testimonies in them and handed them out on the trip. BYU provides a time of intensive learning where facts, skills and attitudes are taught to students to help them navigate a volatile, uncertain, complex and ambiguous world, according to Elder Gong. Elder Gong challenged students to prioritize spiritual elements in their lives: to make time to go to the temple, to go to devotionals, to have personal and roommate prayer and to serve in their wards. “We are discovering something miraculous: this world is not simply one of finite sticks and stones but, in his times and seasons, this world is also one of limitless loaves and fishes,” Elder Gong said. According to Elder Gong, 2040 will be a time of increasing globalization with increased travel and shared information. He said BYU students will be grateful BYU is encouraging its students to view the world as its campus. Students come from over 100 countries and speak more than 126 languages, according to Elder Gong. Global experiences are further built on by missions, classes, campus associations and internships. He also said information is becoming obsolete quicker and that all fields of inquiry experience intellectual fabs and fashions. Not only are the teachings of Christ important, but students will see an importance to the attributes of Christ, according to Elder Gong. Humility is not only a solution to pride but opens the doorway to educational excellence. Humor is also intimately related to faith as they both deal with our incongruities, he said. Elder Gong said looking back from the future is an invitation to prepare for the future now. “It may be as simple as deciding to go to class or finding new ways to learn how to learn with the Spirit with humility, excellence, faith and good humor,” he said. President Stephen W. Owen of the Young Men General Presidency will address BYU at next week’s devotional on Tuesday, Oct. 23.